QUESTION: I have an Amaryllis plant inside in a pot. It bloomed last year at Christmas. I did what the instructions said for the winter. I took it out of the refrigerator this spring, watered it, and it grew 4 leaves, but no flower. What should I have done differently to get it to bloom? ANSWER: It really depends on which Amaryllis you have. Even though the one you have blooms at Christmas time, it is tropical and not for permanent use outdoors in most of the country. 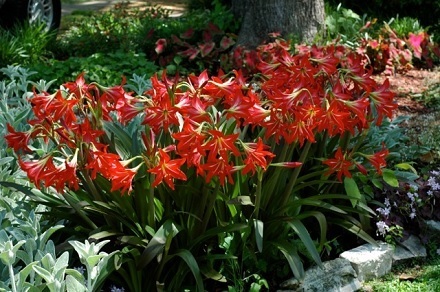 The secret to tropical amaryllis rebloom in the winter is the summer care given after the flowers have faded. Remove the faded flowers and stalks as soon as they are finished but don’t cut off the leaves. Set the pot in a sunny spot indoors and water as needed. When warm spring weather arrives and all danger of frost is passed, move the container to a spot outside that receives morning sunlight. You can set the pot in the ground so that the rim is at ground level or inside a heavier clay pot. The leaves will flop over at first but more leaves will form and be more upright. During the summer, continue to water the plant as needed and feed it every two weeks with Garrett Juice or other organic fertilizers. Gradually withhold water and let the soil dry out before freezing weather arrives in the fall. When the foliage has died down, trim it off and store the plant on its side in a cool, dark place (40 to 50 degrees F is best if possible). The bulb needs rest in dry dormancy for six weeks. During the rest period do not water it. As the leaves dry, cut them off. From October through January whenever you are ready to force the bulb into bloom, repot it using a soil mixture containing compost and rock minerals. See Guides on the Home page of DirtDoctor.com for my recommended formulas. Clay pots are better than plastic since amaryllis tends to get top heavy and tip over when blooming. Countersink the bulb so that one-third to one-half of it is above the soil. Press the soil gently but firmly around the bulb. Water the soil thoroughly and let the excess water drain. Place the container in a warm, sunny location at about 55 to 65 degrees F. Warmer temperatures can result in weak, floppy growth. Keep the soil moist but not overly wet. The leaves may appear first or the leaves and flowers may appear at the same time. It is best to keep the soil on the dry side until growth appears. Flowers up to 8 inches in diameter will be the reward in a few weeks after planting. If all that sounds like a lot of trouble, it is. Do it all or buy new bulbs, your choice. On the other hand, there are hardy amaryllis that are tough perennials for most of the country. Here’s information on these hard to find bulbs. There are other amaryllis for use in the coastal regions, but few match this bulb in its toughness to withstand cold and poor soils. It is believed to be the first hybrid amaryllis with a history dating back to the late 1700's. Even in large crowded clumps, the striking red trumpet-shaped blooms with their white stripes put on a show every year. Johnson's amaryllis is another name for this bulb, in honor of a hybridizer and English watch maker. Also known as St Joseph's lily, you can sometimes catch a slight spicy fragrance when flowers are closely inspected. HABIT: Spectacular spring / early summer flowering bulbs. Long strap like foliage that often does appear until flowers fade away. Red or orange funnel shaped flowers. Hardy to zone 6. CULTURE: Easy to grow in well prepared soil, but will adapt to most soils. Clumps can be divided and replanted in the fall or winter. Necks of the bulbs should be left just above ground level. This is a tough perennial that can be left in prepared beds outside. PROBLEMS: Finding the plant in nurseries is the biggest problem. Parts of the plant are somewhat toxic.